Despite actually being a theatre, the Rose is a rather odd choice for a production. 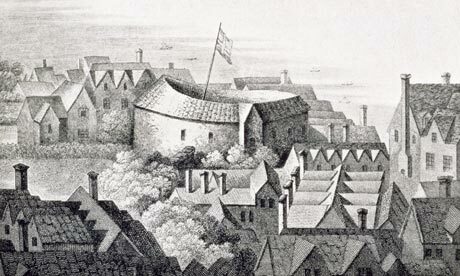 It was the first Elizabethan Theatre on Bankside and home to early works by Shakespeare and Marlowe, yet in its current state it’s an excavation site. As such, the play took place on a small mezzanine area above the site which severely limited its production. Massinger’s Jacobean comedy is well suited to the historic surroundings. The plot tells of Sir Giles Overreach, a self-styled city man out to reap money and fame and who, inevitably, gets his comeuppance. Its pretext is of class distinctions and greed, which to an extent still resonates today. However, this wasn’t emphasised by the direction. Problems with the production stem from the venue. By not being in a traditional theatrical space (so to speak), the production lacked proper lighting and staging. As such, the focus was very much on the words, though they lack the same poetical value as Shakespeare and Marlowe. It’s an incredibly wordy play that was ultimately quite difficult to follow, only heightened by the minimalist design. Though the cast’s attempts to bring the words to life were commendable, the acting was a mixed bag. The central protagonists failed to capture the dramatic weight of their characters, but the smaller parts proved hilarious. Katie Brennan’s bawdy Froth was full of comedy facial expressions and David Brett’s Greedy, though short in stature, was big on laughs. Thomas Shirley as Allworth also suitably embodied the wide-eyed innocence of his character. This was a night full of historic interest and, once fully excavated, the Rose will make an intriguing visit. Unfortunately, the play itself didn’t quite live up to the surroundings.